I'm the type of person that likes to be well-prepared before I travel. I like to know where we're going, what we're doing, and how we're doing it. This post is just to give you a few ideas of what Scotland is like and what to expect when you visit. Plus, I've thrown in a few tidbits pertaining to culture and etiquette. Definitely, not a complete list (that might take days) but some of the bigger stuff you'll probably encounter. Pronunciation: So, you'll fly into one of two cities: Glasgow or Edinburgh. Scottish names are tricky, they don't always pronounce the letters you see and while you can probably bumble through some other names that aren't as common, make sure you can pronounce these ones properly. Glasgow is pronounced "Glaz-Go" with equal emphasis on both parts. Bonus points if you half swallow the word like the locals do. You'll know it when you hear it. Edinburgh is the one I hear most commonly mispronounced. It's pronounced "Edinbura". I know, it makes no sense, but hey, whatever floats their boats. Know the money. The Scottish also use the pound sterling or pounds (£). They have regular (often plastic-y feeling) notes or bills in higher denominations, but their coinage system is very different. No £1 notes, (ok, there are a few but you probably won't see any) but rather they use heavy coins for £1 and £2. What always throws me off is the five pence coin which is very similar in size and weight to the American dime. Etiquette: When walking through the city, it does not matter which side of the sidewalk one hugs. However, when taking the escalator, stay on the right. Yes, there will be signs telling you this, so pay attention. The right is for people standing there as the escalator moves. The left is for people running to catch their train/bus/subway. They will, wonderfully passive aggressively, attempt to move around you, so just stick to the right and you'll be fine. One's personal space bubble is generally 1-3 feet, except when you're on the train or subway and then it's reduced to mere inches. When in the queue (or line) for a restaurant, grocery store, or especially for the ATM, do not, I repeat, do NOT stand close to the person in front of you, especially if it's the person at the front of the line. Give them space and respect the queue. Photo by Martin Usbourne. Sadly, photoshopped, but you get the idea. When eating out, unless there is a sign, you seat yourself. Now, someone may come and take your order for you, but generally you will place your order at the bar. In most pubs, the menus and are up there as well. The bartender will give you your drinks, you'll take a seat, and someone from the kitchen will bring you your food and clear away when you leave. Additionally, there are no hard rules about tipping, and whether you tip or not varies from restaurant to restaurant. Most of the time you'll see the gratuity added to your bill. If not, 10-15% is fine. Culture: You won't see a lot of kilts everyday here unless you're in popular pedestrian walkways, such as the Royal Mile in Edinburgh or occasionally on Buchanan Street in Glasgow. Most of the time, you'll see men in kilts playing their bagpipes so stop and enjoy the music. Irn-Bru is the drink of choice (although whisky is popular as well). It tastes like fizzy cough syrup but you have to try it if you're here. Bonus points if you actually enjoy it, because it's either an acquired taste or lack of taste buds that leads to one enjoying it. Likewise, have a meat pie, some haggis, neeps and tatties, or some cullen skink. If you don't like any of those, don't worry. There are a lot of other excellent foods to be discovered and eaten while you're here. Try some Indian, some seafood, or some wild game if you're up in the Highlands. Or, if you happen to come across a local cheese maker, definitely stop in! Scottish cheese is an undiscovered (and cheap!) treasure. There are 14 Michelin Star Restaurants in Scotland, so perhaps one of those would be up your alley if you're in the mood for something a bit more fancy. Best Mexican food in Glasgow is Topolabamba. Jaywalking isn't illegal, so don't fret if you can't find the nearest crosswalk. Just look right and left (opposite of the USA) before crossing the street. Better yet, do it with a group of people and your likelihood of getting hit really drops. Most of the museums are free, so they are a great place to stop for a bit, dry off and meander around. Plus, they're educational, so it's really a win-win. And lastly, just look up the Scottish National Animal so you can better understand some dry, Scottish humor. So You Want to Visit Scotland? Our lovely, little portion of the UK is ruggedly beautiful. I have really fallen in love with the scenery, accents, and culture of Scotland and I feel it's my duty to share this with the world. ;) Since we haven't had the opportunity to travel much recently, I've had the time to compile a list of places we've visited or want to visit that I think are a must see if you're visiting Scotland. On getting here: We have two large, international airports in Scotland: Glasgow and Edinburgh. Both cater to a wide variety of airlines so searching both for the better price is an excellent plan. How to get around: Well, just how comfortable are you with driving on the opposite side of the car, the opposite side of the road, very slim roads, and dealing with roundabouts? If you're feeling that is quite doable, I would recommend you rent a car, for at least part of your trip. (A word of warning to drivers: while Scotland is quite small overall, between speed limits and roads that follow lochs and peninsulas, it will take longer to drive than what we Americans are used to. So enjoy it and bring Dramamine if you get carsick.) Train travel is the easiest and cheapest way to get around, especially in the cities because driving in the cities can be rather confusing if you're not familiar with the area. Check out Scot Rail for more information about trains. If you don't feel comfortable with driving, there is plenty for you to see near the train rails, especially in the cities. What to see: If you're spending a week in Scotland, you can easily see the big highlights. Luckily for you, I've narrowed it down to what I think is worth your time and money. :) I'm definitely most familiar with the Glasgow and Loch Lomond area, but I'm also working on expanding my horizons. In Glasgow, I would recommend brunch at Peckhams on Buyer's Road for takeaway (coffee/tea + croissant for a couple of pounds plus plenty of delicious foods/drinks to drool over. They also can pack a hamper if you're interested in something like that!) before you browse up and down Buyers Road (and check out the side alleys!) for some incredibly unique shops. Then you can meander over to the Kelvingrove Art Gallery and Museum (free) for some art and culture. From there, I'd recommend a late lunch at Kama Sutra before you walk down Sauchiehall Street. (Or catch the bus or take the train from Charing Cross down to the Bellgrove station.) Then head up the hill to Glasgow Cathedral, the oldest cathedral in Scotland, which also survived the Scottish Reformation. If the weather is lovely, a trip up the Necropolis is also a must because it affords one the best views this side of Glasgow. Now that it's probably getting late, I would head towards Buchanan Street for some late shopping/people watching/ or dinner. Our favorite restaurant near Buchanan Street is Topolabamba for some tasty tapas and drinks. Glasgow is a bit of a party town in the evenings and there is usually plenty to see if you're a night owl between movies, plays, or concerts so it's worth checking ahead to see what's playing. After spending a day in Glasgow, I would suggest renting a car if you can, and driving north towards the Highlands. Loch Lomond is only a half hour drive away and the town of Balloch is small but quaint. Take the A82 North towards Glencoe for some stunning highland views. Since you're probably hungry, grab a tasty lunch from Clachaig Inn (or make reservations to stay the night). Then buckle up for your drive down to the breathtaking Glen Etive (famous for the epic scenes in James Bond's Skyfall). After you've been paralyzed by fear due to the one-lane road, continue the breathtaking experience by driving through Glen Coe and stopping at the scenic stops to take in the scenery. It's well worth your time. I would suggest staying in Fort William for the night at the Lime Tree Hotel and snagging some delicious dessert in the restaurant. We ate dinner at the Grog and Gruel but most recommend eating on TripAdvisor suggests a meal at Crannog Seafood Restaurant which we'll have to try on our next trip north! From Fort William, you have several options: You could take the A87 up to Skye, spend a day there, a night in Portree, and explore all the Skye has to offer. Word of warning, Skye, while small, is full of peninsulas and inlets so it takes several hours to get from one side of the island to the other. The hiking in Skye is stunning and worth your time if you're a fan of hiking. Or you could head northeast and drive along Loch Ness towards Inverness. Stop by the Urquhart Castle* on the banks of Loch Ness for some stunning views if you have the time! No matter which route you choose, you'll end up in Inverness. Eilean Donan Castle, about 20 minutes drive away from Skye. Film photo taken by Aaron. Inverness is beautiful, but it's a definite park-and-walk town. Find some cheap parking and meander around. When we were in Inverness, we were merely driving through, so we grabbed a quick lunch at Morrisons grocery store (don't laugh) but Trip Advisor has some excellent recommendations. You can meander over the River Ness, see the Botanic Gardens, Fortrose Cathedral*, or Brodie Castle. Outside of Inverness is the famous Culloden Moor where the British stamped down on the Jacobite rebellion. If you're a fan of history (or a fan of the Outlander novels) you'll probably want to stop here. As you take the A9 south, you'll pass through Cairngorms National Park. This park is known for it's scenic beauty and wide variety of animals. Unlike American National Parks, British National Parks were developed around already existing towns so you'll have plenty of small towns to stop in and snag some petrol and food if you need it. You'll eventually hit the city of Perth and then the city of Edinburgh. Edinburgh is probably going to be the most expensive city you visit in Scotland. The posh air and ancient history are quite costly. :) There is probably something for everyone in this town, but here are my recommendations. Park your car and walk up Princes Street. You'll pass the large Sir Walter Scott Monument and if it's open, you can take the slender, winding stairs up to the top. If the weather is cheery, it will probably be quite crowded. Further down on Princess Street is the National Gallery of Scotland (free!) and well worth a visit, because the collection is quite impressive. If it's a sunny day, walk down through the Princes Street Gardens or if it's rainy, Edinburgh has some (expensive) shopping to explore. Over on the Royal Mile, you have the options of visiting Edinburgh Castle* and Holyrood Palace (where Her Majesty stays when she is in Edinburgh). You'll pass the impressive St. Giles Cathedral on the Royal Mile and it's a very informative, free visit. The Edinburgh City Chambers courtyard displays the handprints of famous, modern locals and it's a neat little stop. Nearby is the National Museum of Scotland (free) and it's impressive collection of Scottish history. Additionally, the rooftop access affords the viewer splendid views of the city and it's generally not crowded. If you want to get away from the crowds, you can hike up to Edinburgh's Folly or all the way to Arthur's Seat or over to see Craigmillar Castle*. 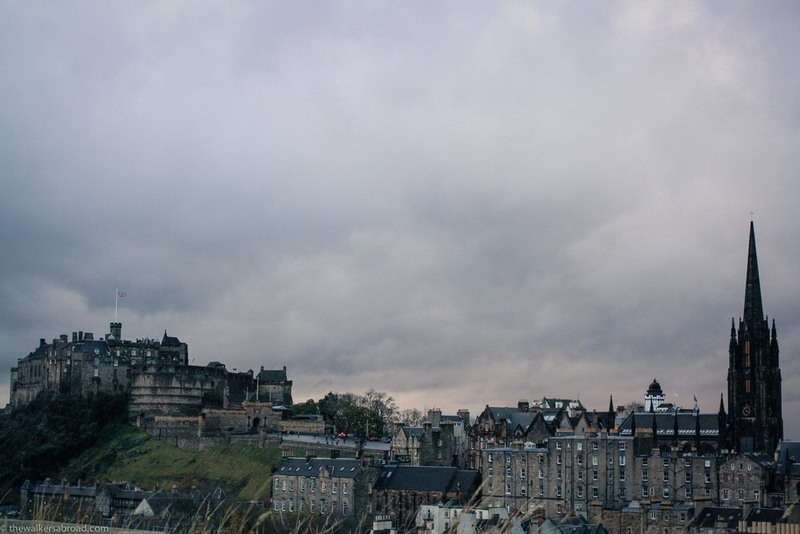 Edinburgh is a beautifully picturesque town and there is really so much to be seen, no matter the weather! If you still have time left, take the train down to the Borders. Scotrail has recently opened a rail line into the Scottish borders and from what I've heard and read, it's a splendid trip. The train leaves from Edinburgh and stops at various towns and villages along the way. There are tours offered or you can go on your own and see Abbotsford House (Scott's house), Jedburgh Abbey*, Hermitage Castle, Dryburgh Abbey* or Melrose Abbey* and really so much more. This trip is definitely on our list of things to do this summer as the weather warms up! This route makes these locations so much more accessible. Additionally, you can drive down to Dumfries and Galloway (home to Drumlanrig Castle and Caerlaeverock Castle*) on the western borders for some more beautiful sights. If you're looking for even more places to visit especially off the beaten path, I would suggest the town of Oban (on the west coast because it is also home to various ferries that will take you to some of the Western Islands), the Orkney Islands at the very north of Scotland, or the Inner or Outer Hebrides. Getting to these places is a bit more difficult because you'll need to figure out transportation there and back, and a trip to the isles will probably be more costly than staying on the mainland, but it would definitely be a trip to remember! *And lastly, if you're trying to save money and but still want to see a lot of the historic sites, I marked with an asterisk the Historic Scotland sites where you can get a year long membership. Visiting the most popular (and thereby expensive) sites can add up and this would give you the opportunity to see even more for a set fee.